Earlier this year Neill was asked to design a series of bridal bouquets using Hydrangea and Freesia for the annual Fusion Flowers WEDDINGS magazine. 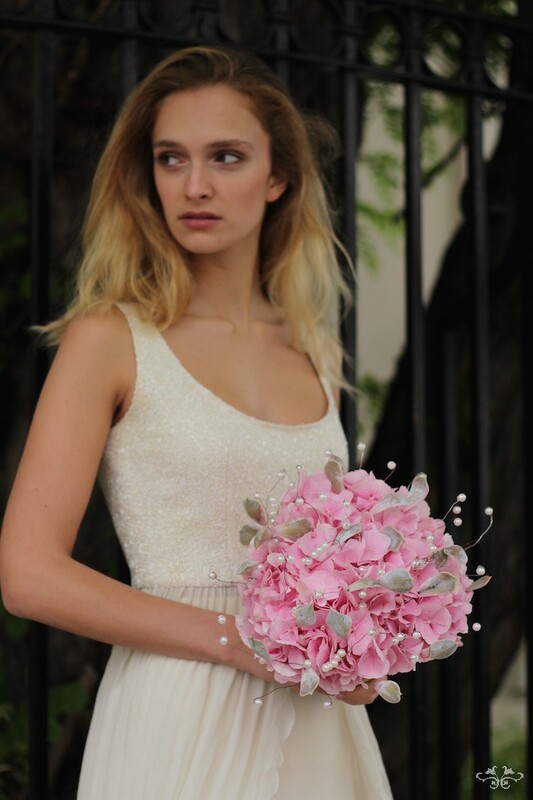 Here is a detailed look at the stunning bouquets he created for the photo shoot in Belgravia. The release of Fusion Flowers WEDDINGS magazine is an annual event in the floral industry when the best floral designers around the world reveal their new styles, trends and techniques for bridal bouquets. So of course I was delighted to be asked to create a series of luxury bridal bouquets focusing on two different flowers, Hydrangea and Freesia from top Dutch growers. Four different varieties of Hydrangea with Phalaenopsis Orchids and trails of Ceropegia decorate the Birch structure of this bridal bouquet. 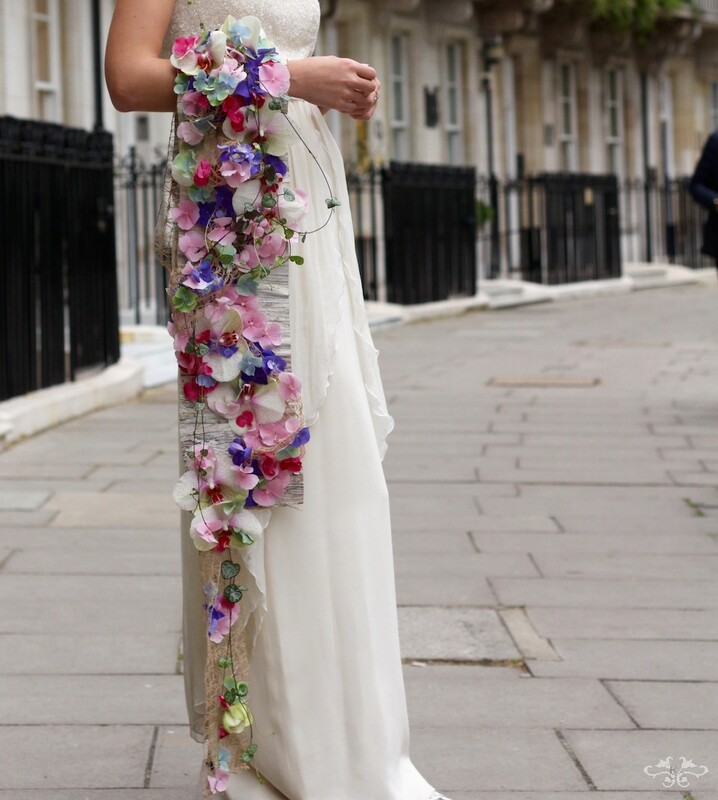 With a backdrop of Belgravia's elegant architecture, the exquisite stone clad buildings of Wilton Crescent and black iron railings, we had the perfect setting for a photo shoot and for our beautiful bride to showcase our intricate bridal work. When I meet with brides to discuss their bridal bouquet, my first question is if they have chosen their wedding gown. Designing a bridal bouquet must be in harmony with the wedding gown as well as the form and style of the bride, just like designing the reception flowers must be in harmony with the venue and the scale and style of the architecture. With the next bouquet, I wanted to show the pure beauty of the magnificent Hydrangeas and echo the intricate detail of the bodice of the wedding gown with pearls. 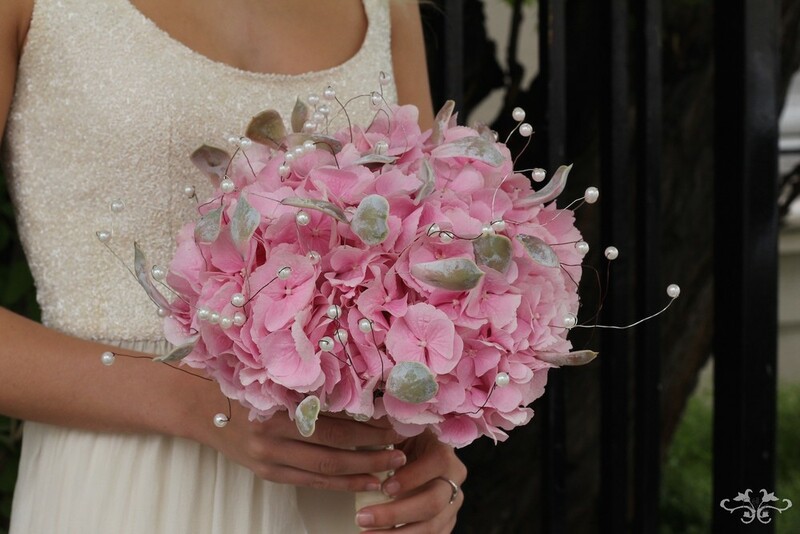 And here is another version of this bouquet with 2 colours of Hydrangea along with the pearls and succulents. My next Hydrangea bouquet is also designed to complement the gown, but this time focusing on the line of the skirt. The movement of the muslin inspired the shape of this bouquet. We created a structure with Ivy vine (with leaves removed) and filled it with a gorgeous deep blue Hydrangea, a pale green Hydrangea and a few florettes of a pale blue Hydrangea along with trails of Tillandsia. The shape of this delicate bouquet repeats the line of the dress. Thus completes our work with Hydrangeas. Now for the Freesias! 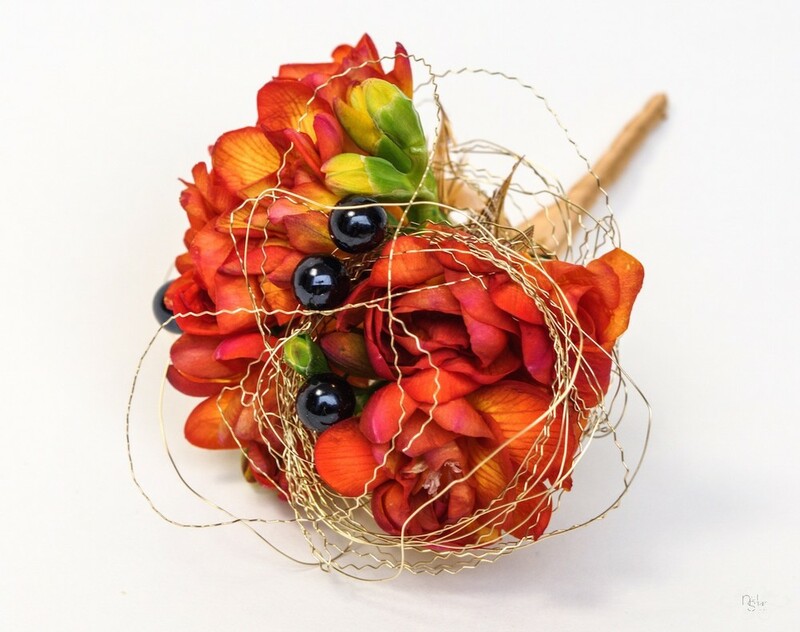 This bouquet has a structured base in a curved tear-drop shape that we created with fine wire to support the Freesia and tropical Bromeliad along with the ribbon. The black pins are both functional and aesthetic. The colour harmony of the Freesias with the Bromeliad is incredible! 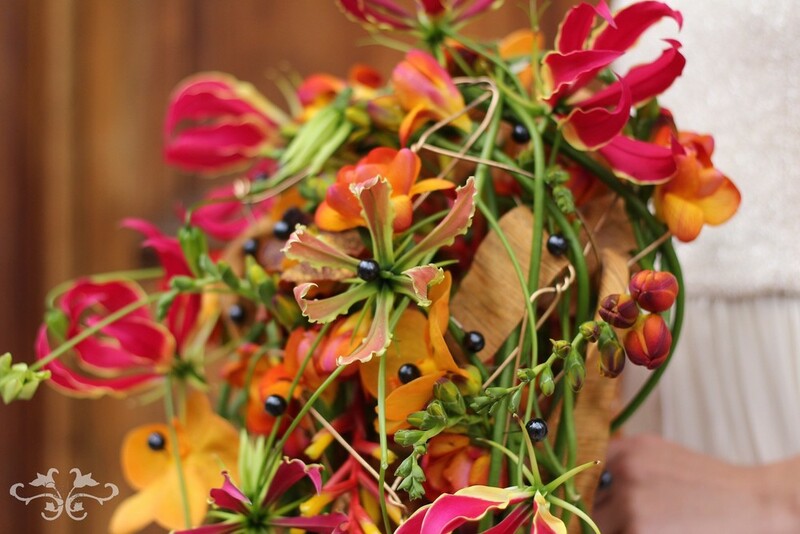 Using the same cascading shaped frame, we created another bouquet combining the elegance of the Freesias with the panache of Gloriosa for a bold, opulent effect rich in both colour and texture. Yet another style of bridal bouquet that is popular with our brides is the Pomander. We arranged pink and purple Freesias into a ball-shaped design intertwined with curls of Birch and long trails of Ceropegia. I love the way the lush green buds of Freesia contrast with the open flowers. Of course, every bride has a groom and every bridal bouquet needs a button hole so here are a couple to pair with 2 of the bouquets above. 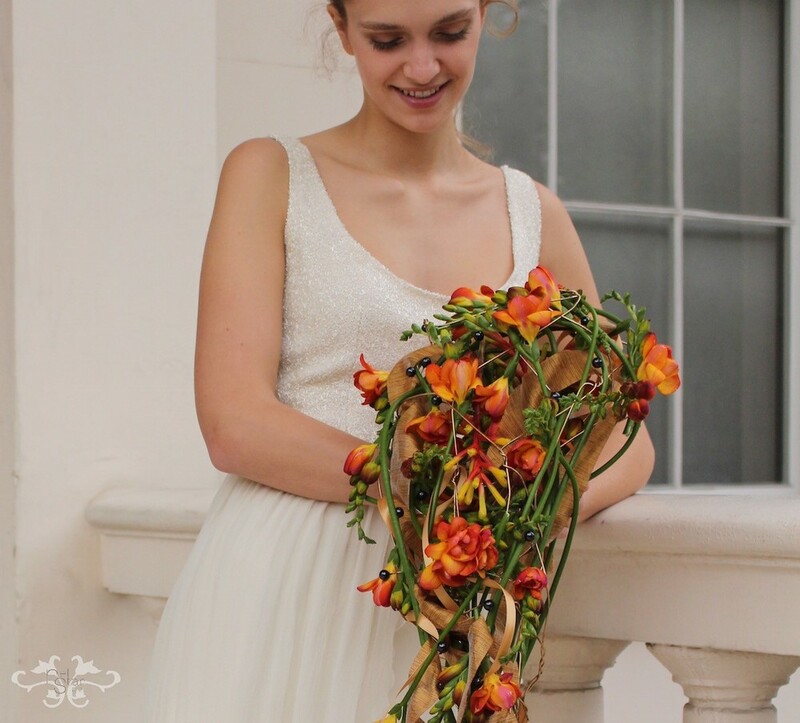 I hope that these bridal bouquets have portrayed to you the passion I have for design and for creating bespoke floral arrangements with absolutely stunning flowers. Inspiration combined with creativity and quality allows us to make floral designs of great beauty and emotion. This is what we do for all our brides and clients. If we can create something very personal for you, for your wedding or event, give us a call on 020 7235 6469 or come and see us at the boutique.